This city on New Zealand’s north island is nestled in a huge, ancient caldera that is about 20 km across at its widest and around 16 km across at its narrowest point. Lake Rotorua is close to 300 meters above seal level and is at the heart of the endearing place. There are tons of things to do here including boating, helicopter tours, hiking, biking, fishing, museums and so much more. This place is also known the world over for its geothermal activity which includes hot mud pools and ponds of boiling water. Yes, Rotorua is definitely a tourist haven but we found it to be warm and welcoming and not overly crowded. This morning we spent exploring the city at the edge of Lake Rotorua. There’s a huge park and governmental gardens that run along the lake. It’s really beautiful here. As we walked the shores we saw flowers and ducks; swans and beautiful vistas. Along the way we came across Te Awara Waka Taua. Waka Taua means “a vessel for the convenance of a war party”. This beautiful piece of craftsmanship is 20 metres in length and weighs approximately 2.5 tons! She’s constructed completely by hand using old world techniques and tools. Hundreds of years ago the Māori people would greet strangers entering their harbors in wakas such as this one. Huge war parties would enter the harbor to intercept and intimidate the intruders. Today they are used in competitions and ceremonial events. We met some other tourists during our walk who suggested that we keep walking along the lake until we reached St. Faith’s Church located in the Māori Village of Ohinemutu. They said we’d be happy we made the trip so we kept walking and they were right….what a treat we found there. This quaint Māori Village houses the magnificent Tamatekapua meeting house which is named after the paramount Chief and Captain of the Te Arawa canoe. The carvings on the large house are absolutely exquisite and each is adored with hundreds of inlaid, shiny Pua shells. We weren’t allowed inside but it was a pure treat just to see the outside and relish in the beauty and workmanship that makes this place so special. Note the steam in the background. This is coming from the mud pools and boiling water just below the surface. In the village they house the oldest bust of Queen Victoria in the world. It’s a wooden bust commissioned by Agent-General Isaac Featherston in 1873. It is said to have been given to Te Arawa in 1875 to honour the tribe’s efforts as an ally of the British Empire during the New Zealand Wars. The bust stands atop of a pillar about 10′ in the air. We were encouraged to have a photo taken with it as there is currently much political conversation regarding it and they fear it may not rest here much longer. 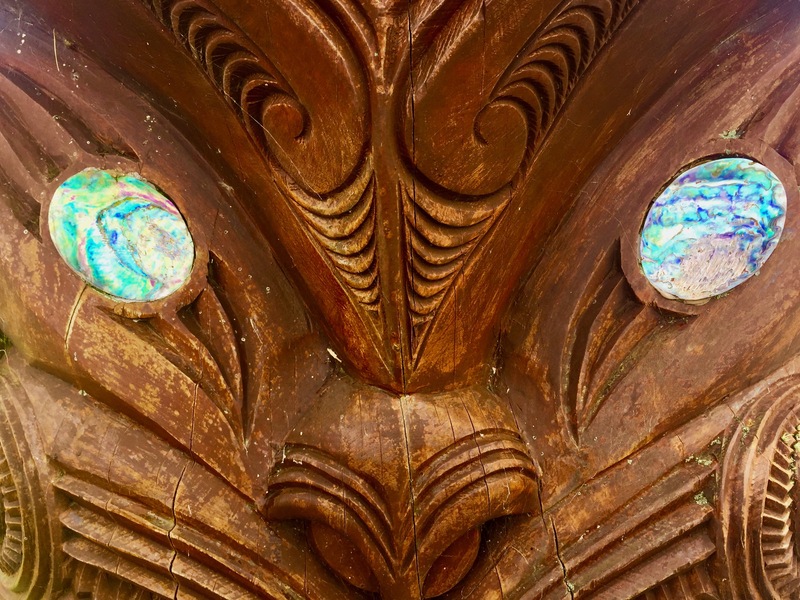 There are other ornate Māori statues, panels and benches around the open square. Along the village edge we saw hot steam rising from the thermal mud pools that bubble just under the earth’s surface. There are even pools of boiling water at the edge of the lake that the villagers still cook in today. The highlight of our day came when we ran into a wonderful young man named Shaloh Mitchell. Shaloh’s family has lived in the village for hundreds of years. He is an anthropologist and spokesperson for the village and his tribe. Dan & Jack were standing in the square chatting as Shaloh came by. They struck up a conversation asking him questions about the village. Before they knew it he was giving them a history lesson on the Māori people and their culture. I was in the church with Mary and we came out to find out if the guys were going to join us. As we approached them we could hear there was great information and wisdom being shared. The man speaking was shirtless and tan and had a strong and handsome face with a square jaw. His dark brown eyes set apart by his flat, broad nose that is so characteristic of the Māori people. He had a smile that was contagious with bright white teeth that shone every so brightly next to his darkened skin. He spoke with great passion and it was easy to see how much he loves and admires his people and their traditions. He just seemed to exude pride with each and every word. It was such a joy to listen to him. Shaloh told us that they were in the process of cataloging hundreds of anthropological finds in their meeting house. He said he had been up until the wee hours of the morning that day working on just that. We are so grateful to Shaloh for the time he spent with us. It was like spending time with an entire village and we certainly will not forget the wonderful moments we shared. On the way out he even gave Mary and I each a feather from a 500 year old Kiwi bird they had cataloged the night before! After we returned from the day we did some research on Shaloh. It turns out he’s really quite something. He’s not just a tribal member, rather he’s one of THE main advocates and spokespeople and quite high up in the community of Rotorua. In fact, when Prince Harry & Megan visited the area in the Fall of 2018, he and his family were an integral part of the festivities as well part of the welcoming committee. They had an entire event for the Royals in the very spot where he was speaking to us. Shaloh even has published articles regarding his tribe and their anthropological finds. We found it to be rather awesome that a man of his stature would greet us, shirtless, and spend so much time enthusiastically teaching us about his people. It just goes to show that you never know who you are talking to and what you can learn from them. Whakawhetai koe Shaloh! Our final stop in the Ohinemutu Village was at St. Faith’s Church. For a small donation you can enter this absolutely beautiful tudor style church built in 1914. There are many wood carvings, panels and beautiful stained glass depicting scenes of the bible as well as scenes of the world. They even have a stained glass image of Jesus wearing a Māori cloak that makes Him appear as if He’s walking across Lake Rotorua. Unfortunately it was cracked and now has tape on it to hold it together but it was still a wonderful sight to see. Behind the church is a cemetery that holds the remains of Māori soldiers who went to war and never returned. It sits right at the edge of Lake Rotorua and even has a small covered area with benches for one to sit and ponder life. We all are thrilled that we walked the extra few blocks to spend some time in this village getting know more about the Māori people and their culture and very grateful for our chance meeting with Shaloh. For now we are headed back to the house to get ready for a very special evening at the Tamaki Māori Village where we will have a chance to truly be immersed in the culture of these amazing people. With all that we learned today we’re certain this should be an incredible experience for us.